*We will be showing the Broncos vs Chiefs game (in the lobby and on the big screen -we know what a big game this is!) 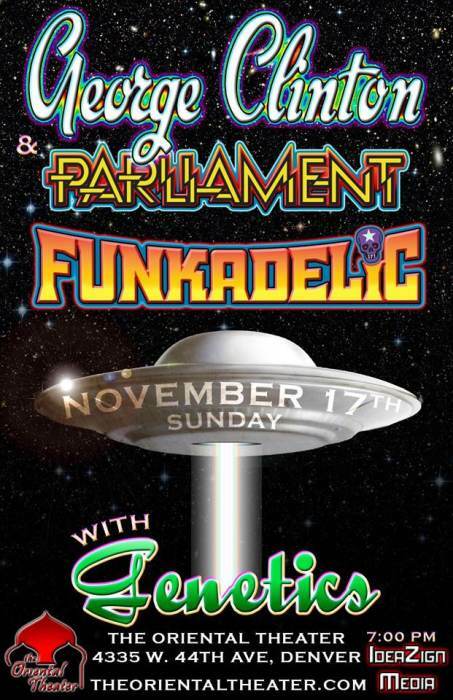 so George Clinton and Parliament Funkadelic﻿ will be playing AFTER THE GAME. We will be opening doors at 6:15pm for ticket holders (we will be back showing showing the games for free next Sunday!). Opening band Genetics will be playing while the game is on around 8:30. Beginning in the early 1980's, Clinton recorded several solo albums, although all of these records featured contributions from P-Funk's core musicians. The single "Loopzilla" hit the Top 20 on the R & B charts, followed by "Atomic Dog", which reached #1 on the R & B and #101 on the pop charts. In the next four years, Clinton released three more studio albums and charted three singles in the R & B Top 30. In 1985, he was recruited by the Red Hot Chili Peppers to produce their album Freaky Styley, because the band members were huge fans of George Clinton and funk in general. Clinton, in fact, wrote the vocals and lyrics to the title track which was originally intended by the band to be left as an instrumental piece. The album has since sold 500,000 copies after the Chili Peppers became popular years later. 1994 saw Clinton contribute to several tracks on Primal Scream's studio album Give Out But Don't Give Up. In 1995 Clinton sang "Mind Games" on the John Lennon tribute Working Class Hero. In the 1990's, Clinton appeared in films such as Graffiti Bridge (1990), House Party (1990), PCU (1994), Good Burger (1997), and The Breaks (1999). In 1997 he appeared as himself in the Cartoon Network show Space Ghost Coast to Coast. Clinton also appeared as the voice of The Funktipus, the DJ of the Funk radio station Bounce FM in the 2004 video game Grand Theft Auto: San Andreas, in which his song "Loopzilla" also appeared. Rapper Dr. Dre sampled most of his beats to create his G-Funk music era. In 1999, Clinton collaborated with Lil' Kim, Fred Durst, and Mix Master Mike for Methods of Mayhem's single Get Naked. Displaying his influence on rap and hip hop, Clinton also worked with Tupac Shakur on the song "Can't C Me" from the album All Eyez On Me; Ice Cube on the song and video for "Bob Gun (One Nation)" on the Lethal Injection album (which sampled Funkadelic's earlier hit "One Nation Under A Groove. ", Outkast on the song "Synthesizer" from the album Aquemini; Redman on the song "J.U.M.P." from the album Malpractice; Souls of Mischief on "Mama Knows Best" from Trilogy: Conflict, Climax, Resolution; Killah Priest on "Come With Me" from Priesthood; and the Wu Tang Clan on "Wolves" from 8 Diagrams. Clinton founded a record label called The C Kunspyruhzy in 2003. He had a cameo appearance in season two premiere of How I Met Your Mother in 2006. "You're Thinking Right", the theme song for The Tracy Ullman Show, was written by Clinton. Also in 2009, Clinton was inducted into North Carolina Music Hall Of Fame. Also in 2009, Clinton was inducted into the North Carolina Music Hall of Fame. Parliament-Funkadelic is a funk, soul, and rock music collective headed by George Clinton. Their style has been dubbed P-Funk. Collectively the group has existed under various names since the 1960's and has been known for their top-notch musicianship, politically charged lyrics, outlandish concept albums, and memorable live performances. They influenced numerous post-disco and post-punk music groups of the 1980's and 1990's. The collective's origins date back to the doo-wop group The Parliaments, formed in the late 1950's in New Jersey. Under Clinton's direction, by the early 1970's, the groups Parliament and Funkadelic were operating concurrently and consisted of the same stable of musicians playing different types of funk music for two different labels. 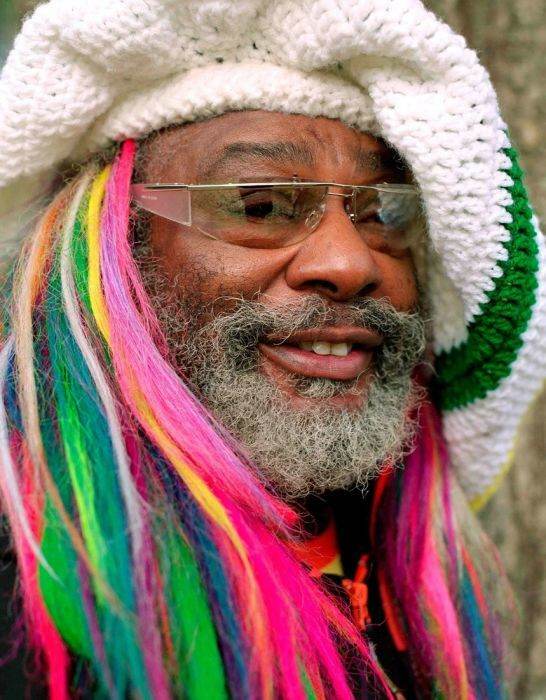 The name "Parliament-Funkadelic" became the catch-all term for the multiple bands in Clinton's stable. By the late 1970's the collective had grown to include dozens of musicians recording and touring under many different group names and solo projects. By the early 1980's, Clinton consolidated the collective's multiple projects and continued touring under the names "George Clinton and the P-Funk All-Stars" and "George Clinton and Parliament-Funkadelic". Sixteen members of Parliamnet-Funkadelic were inducted into the Rock and Roll Hall Of Fame in 1997.